Probable not the most exciting film but a very interesting one. 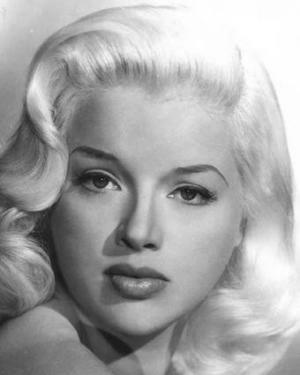 Laura Del-Rivo’s debut novel The Furnished Room was first published in 1961. Set in and around Notting Hill West London it’s tells a story that has a background involving slum landlords, down at heel ex-military toffs and British far right street rallies. Basically a decent guy, Joe Beckett lives in a world described by the author as a ‘twilight world of boarding houses, bottle parties and cafes’. He is a discontented young man who drifts from job to job, which was admittedly easier to do during the sixties. 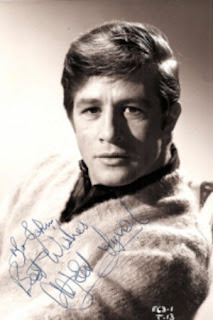 He also does not have a settled relationship, tormented by his faithless girlfriend Isla he drifts from women to women including a sympathetic older married women Georgia. When Joe encounters Captain Richard Dyce, a disgraced ex-military man, he is drawn into a murderous conspiracy. 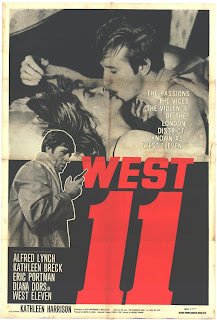 Based closely on Del-Rivo’s novel Keith Waterhouse and Wallis Hall wrote the screenplay that Michael Winner directed as West 11 (1963) named after the postal district that the film was set in. It stared Alfred Lynch as Joe Becket, Eric Portman as Richard Dyce, Diana Dors as Georgia and television star Kathleen Breck as Isla. Also involved in the film was the cinematographer Otto Heller, a Czech émigré whose first step in film making was back in 1918 but better known in the UK for his work on 60s films which include Peeping Tom (1960), Victim (1961), The Ipcress File (1965), Alfie (1966), Funeral in Berlin (1966) and another of Winners British movies I’ll Never Forget Whats’ Is Name (1967) which starred Oliver Reed who was originally chosen to play Joe Becket but was not available. The musical director was Stanley Black who was also the maestro on three of Cliff Richards sixties musicals. The main haunting jazz theme is played by Stranger on the Shore man Acker Bilk and also featuring in the film are Ken Colyer and his band and the Tony Kinney Quintet. As I said at the beginning of this ramble this rare black and white film, put together at Elstree Film Studios, is now an interesting artefact from the point of view of Michael Winners early oeuvre before he abandoned his social conscience and decamped to Hollywood ruining his filmmaking career. The other interesting thing, as with most sixties UK cinema, is to encounter an entirely different world to what we live in to day, taking me back to my child hood playground, the streets of London. See also British New Wave 1959 - 1963.